Weeks and months fly by. The last update brought me to Khartoum, since then I’ve been back to Damascus [blogged here], cycled across from the sands of Sudan into the lush green mountains of Ethiopia. These are the memories of the last days of Sudan. 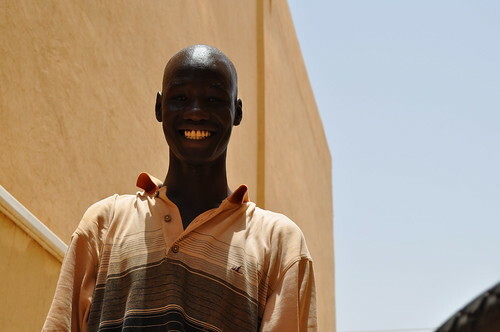 After reuniting with Kenny in Khartoum, we spent a workmanlike week updating this website, building a CV site for our CouchSurfing host, Omar and importantly for me finalising some new tenants moving in to my place at home. Luckily my Mum was on hand to make a smooth transition; without her much about this trip would be considerably more difficult; thank you Mumma. As a result I’ve now got about £250 of income a month to sustain this ever-lengthening adventure. Khartoum is an intriguing city, although there didn’t seem much to visit or actually do; especially on a budget. Kenny, by now well accustomed with the city, offered me some options on my second day back; “Well we could go to this nice roundabout… or ... (long pause) … a cemetery”. To be fair options did improve but I felt oddly caught in the ex-pat bubble. 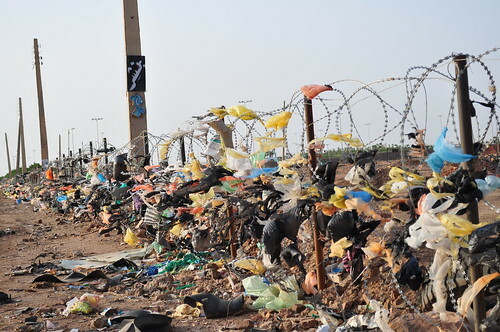 Khartoum is a rapid changing place; the evidence of modernisation is clear, although the regime could be said to be lagging. The goodwill of the Sudanese people is as evident as ever, although nearly all I spoke to felt the repression of the state as a daily feature of their lives. On Januray 9th 2011, there is a referendum on independence for the south of the country. Who knows what will happen but it seems the vast majority feel the south will vote for independence. Here’s hoping this is a genuine gesture by President Bashir to offer them control of their future. 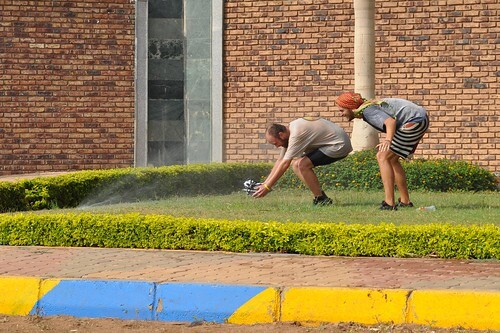 The first few days cycling out of Khartoum were quite brutal; gusting headwinds, searing heat and one of the rare stretches with little distracting natural beauty… although we did get refreshing roadside sprinkler shower. Looking for some alternative beauty I filmed some plastic bags stranded on a barbed-wire fence blowing in the wind. This innocuous action almost caused an international incident when we were swiftly apprehended and escorted to a police station. You need a permit to film or take photos in many parts of Sudan; a fact I’d conveniently (until now) ignored this. Normally we wouldn’t have worried but on this day we weren’t quite spot-free. I didn’t have the permit; this was a military facility… and Kenny’s visa had expired. After a little roadside protest, the chief was called; in no uncertain terms he demanded us at the police station. When we arrived, there were stern looks all around. Our passports were carefully analyzed. Grave looks appeared. My Arabic is improving but still basic but from what I could understand the situation didn’t sound good. More sergeants arrived. The word safara (embassy) was banded about. Then the passports were scrutinized again. We were playing it cool but internally wondering what on earth they were gong to do. Then to our relief it was discerned that we weren’t Israeli spies, as initially expected; you know the type of hobo-like spies you often find on international missions cycling around filming plastic bags. It must say something about the propaganda these police are fed. Miraculously Kenny’s expired visa wasn’t spotted despite at least seven set of eyes on it. We were given a quick lecture advising us of the perils of being Israeli and we were soon sent on our way with a parade of smiles and waves. Incident over; free to find it funny and unclench sphincter. 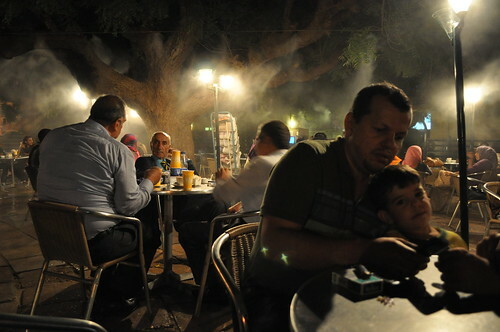 Cultural awareness and sensitivity should be two ever-present travel companions, so it was with some delight Kenny and I were told that Koran makes concession for travelers during Ramadan, allowing them to eat and drink during daylight hours. This was like the best of both worlds, eating during the day and feasting a night. As sunset drew near on our first night outside Khartoum we were waved insistently off the road by a man with light batons more at home on a Top Gun flight deck. We were ushered into a roadside feast put on purely out of the kindness of the people and their desire to please Allah; what a fitting way to do it. As the sun fell beneath the horizon, we awaited confirmation of the end to the day’s fast on the radio. A hundred or more men lined the matted, desert floor awaiting the call; gazing and murmuring at the feast in front of them. The call came and in a dignified rush, hands flew from dishes to mouths and back to dishes. There was a fervor only a hard working man who’s fasted over 12 hours in searing heat can muster. The food and the water were quaffed at remarkable rate before being called to an abrupt halt for prayer. I’m sure most of them could have used more than the five minutes or so they had to eat, I certainly could of, but they would get their fill later. It’s quite an oddity that most Muslims gain weight during Ramadan. That we were not Muslim didn’t seem to bother anyone. 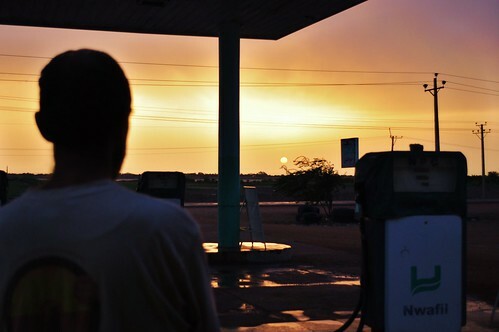 Our hosts were delighted to show us their hospitality, and as now had become customary we ended up being given a place to sleep for the night in the nearby petrol station. This was a ritual repeated each night, without fail – without ever wanting something in return. 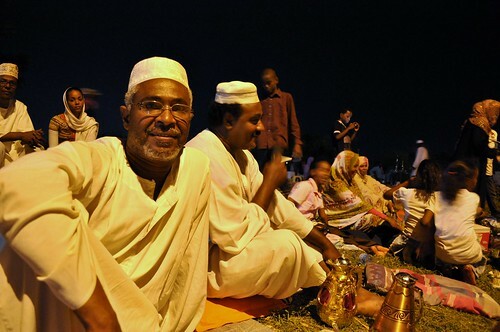 The beauty of this culture in Sudan left us with a humbling lesson: who do you know who would offer their own bed to a complete stranger if he asked where he might sleep? Or the food from their plate simply because they thought he was hungry? What I thought of my attempts at generosity, showed how little I knew. We’d had nothing but sand for well over 1000km and virtually no hills for almost 3000km. 3000kms of flat cycling may sound good but on the other hand from ground level you just don’t see very much. Hills are tougher but even when you curse them, the pleasures outweigh the pain - hidden landscapes are revealed; the unexpected rears its head and of course there’s the downhill cruising with the wind in you hair, glowing with a sense achievement. So with that said when the first hills rose from the sandy pan landscape it was a welcome sight. I scrambled up the first mound we reached. Looking down from high it cast the altered perspective I’d been missing. As the landscape changed so did the caste of the people; the Arabs of the north mixing with their dark skinned Nubian countrymen from the south and brown gold skin of the Eritreans, Ethiopians, and Somalis to the East. 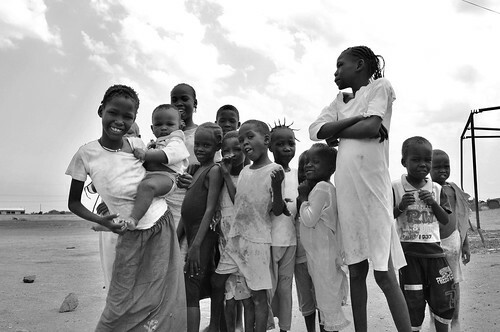 There was lots more children; running around partially clothed, in fitful arrays colour. There was laughing and screaming. 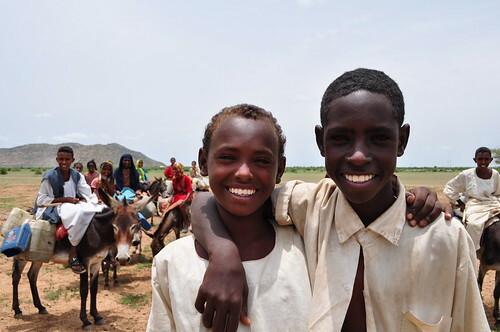 Skinny livestock moseyed along roadside followed by boys with sticks. Circular mud huts appeared with thatched roofs and open doors, at first on their own and then in whole villages. Fires smoked. Towns buzzed. We had arrived somewhere new; not on the map; the Africa of my childhood imagination; ‘Black Africa’. 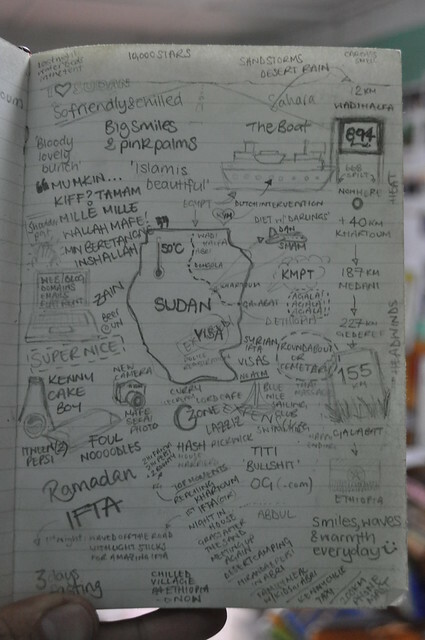 On our last night in Sudan we sketched our memories of our time, almost too much to remember. We found what seemed like a good pitch for our tent and snuggled down listening to the thunderstorms to the east raging over Ethiopia. A few hours later we were awoken by the rains pummeling our tent. It’s a brilliant tent but not as waterproof as it used to be and the rain fell on us like a mist inside. This was soon accompanied by a buoyant feeling as our sleeping mats began to rise. It quickly became evident where we’d pitched our tent was flat because it was a dried up pond. As we sat tight in the tent wishing the storm to pass we chuckled at our predicament; after spending much of ride through Sudan wishing for water, on our last night it ended up giving us just what we wanted – like the rest of the country – more than we ever could have wished for.